What is your view on horse racing? Horse racing is a multi billion dollar industry providing jobs, tourism, income for the economy and in most cases enjoyment for those who wish to watch it. However, do we really give enough thought to the animals welfare in all of this. In recent racing years, there has been a lot of controversy over racehorses being shot either on the track or in a stable environment because of an injury caused in a race. 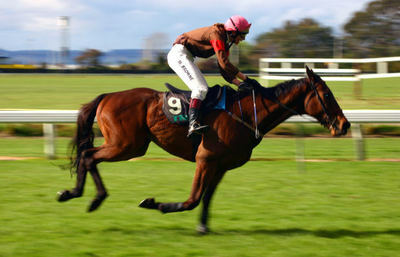 Many would argue that the horse would not have obtained the injury were it not for being in a race. I am totally against it. For every thousand horses bred for the industry , 5 will make it to race a big race, the majority of the rest are put down, or put to dog food. 1. Using whips to make the horses run faster is a form of animal cruelty. 2. Making the barriers so high that some horses end up falling, getting injured, and even dying, is a form of animal cruelty. I don't think whips are allowed anymore, but the barriers are still too high, and many horses suffer many injuries - some fatal. If the fences were made lower, and any other form of cruelty I'm not aware of were dealt with, then I would be okay with it. I hate horse racing with a passion, just as I hate all animal racing in general - it's just cruel! My family has always been involved with harness racing in different ways. I know there are many things that happen that aren't great for horses, but many horses being raced live love and presumably happy lives. I believe horses should be allowed to race until they're at least three years of age, and they shouldn't be over-raced. A horse can damage itself just frolicking in a paddock, but yes, racing can be dangerous too. Life's like that though, good things happpen, and bad things happen. It's certainly an issue worth much thought. I went to a Melbourne cup once. Going through the gates I was accosted by protestors. Admittedly it put a real dampener on the day and while I did place a couple of bets, it made me look into it more when I got home. It all really saddened me and I can say I've never been back to a horse race since nor made any bets. I feel the same way with greyhound racing. If you buy clothes online, do you often have to send them back because they are the wrong size, colour etc.? How many hours per day do you spend on your craft?